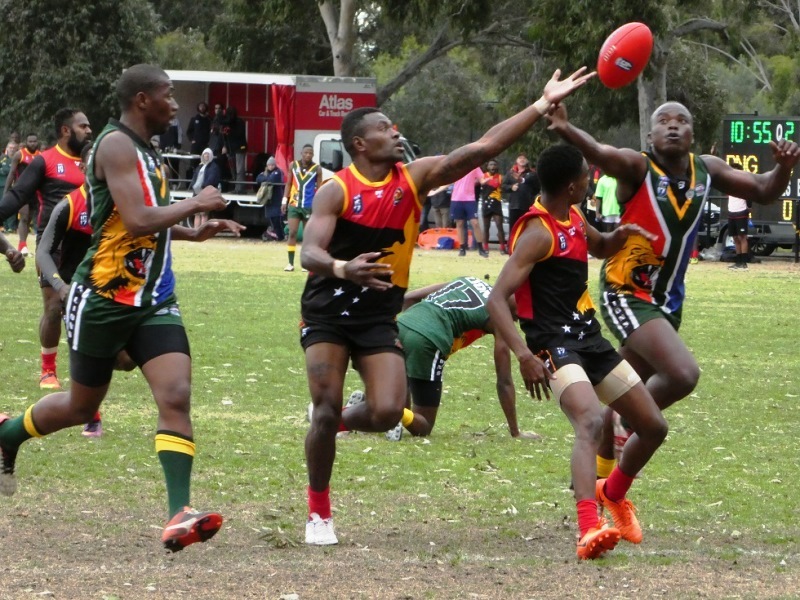 The PNG Mosquitos continued their good form to win and win well over the RSA Lions. The scoreline might imply an "easy" win with the result a predictable win to the Mosquitos but they still had to work hard against a determined South African side that was intent on being competitive. Both teams were surprise first-round losers which looked likely to preclude them from the Grand Final but the Mosquitos have learnt from that experience and improved markedly whilst the Lions have struggled against the Revolution and have only just beaten the Fiji Tribe. In round three the Mosquitos moved back into favouritism with a superb display of athletic and skillful football tinged with aggression and unrelenting accuracy. They had the ability to shark the ruck contests against the tall USA Revolution team convincingly beating a team that was in form. 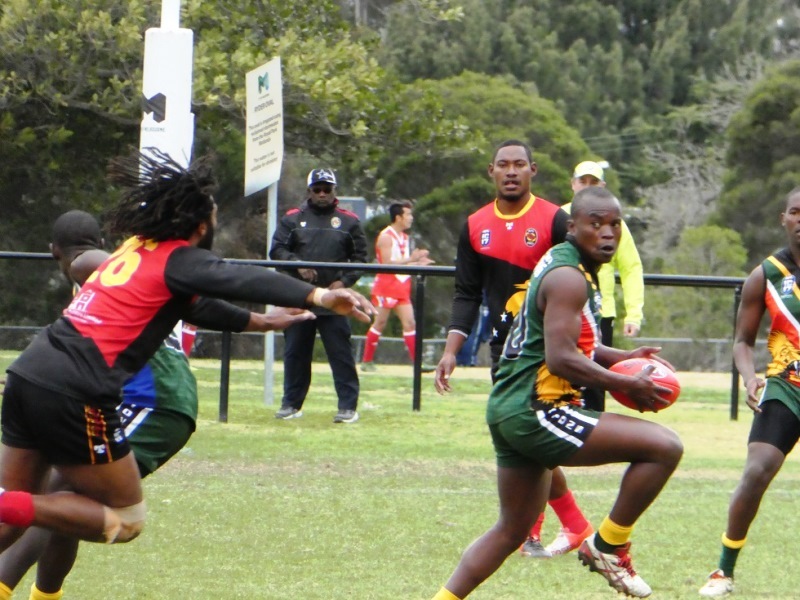 Probably the main interest in this game was in the Mosquitos percentage and whether Amua Muzza Pirika # 10 Could kick another bag of goals and challenge for leading goal-kicker after a six goal haul against the Revolution. The ground was again looking in fine condition after overnight rains but while the weather was slightly warmer the grounds did have a distinct wind blowing at an angle across the them. PNG kicked with the aid of this breeze after the customary “haka” was performed this time with a verbal response from R.S.A. Size for size the two teams are almost equal in make-up. The Mosquitos were immediately into attack and John Ikupu #26 took a great flying mark and converted from the arc. He took another flying mark and the ball dropped short only for the ball to rebound back to him for a simple mark and goal. Malibongwe Mlamli #28 was holding his own in the ruck and doing valuable work around the ground for the Lions and their defence was committed as in Tebogo Monyemoratho #29 effots but Emmaus Wartovo #12 goaled from 50m for the Mosquitos after a penalty for a high tackle. It was an interesting decision because he had dived on the ball. PNG. were getting numbers to the ball and once they had gained possession they used the whole ground, often switching very wide.This opening-up of play actually benefitted the RSA to a degree with Vuyisile Sokoyi #1 taking some flying marks on the wing trying to produce some drive. Karabo Marokoane #18 executed a superb legal bump on Laurie Logo #22 P.N.G. to send him literally flying. The thought for the second quarter was wether the Lions could take advantage of the wind. For a while it seemed they could with Malibongwe Mlamli #28 working hard and John Ikupu #26 taking some good defensive marks. However Laurie Logo #22 gathered and goaled against play. P.N.G.’s smaller players like Scott Johnson #6 an Hewago Paul Oea #1 where chipping in well often splitting the packs. Around the 9 minute mark the wind dropped and the PNG took the ascendancy. Emmaus Wartovo #12 accepted a pass to goal from 40m. Hewago Paul Oea #1 was held when running into an open square and goaled from the penalty. Emmaus Wartovo #12 used his body well to take a diving mark and convert fro 25, Scott Johnson #6 accepted a ball that off-breaked in front of #19s to goal from close in. 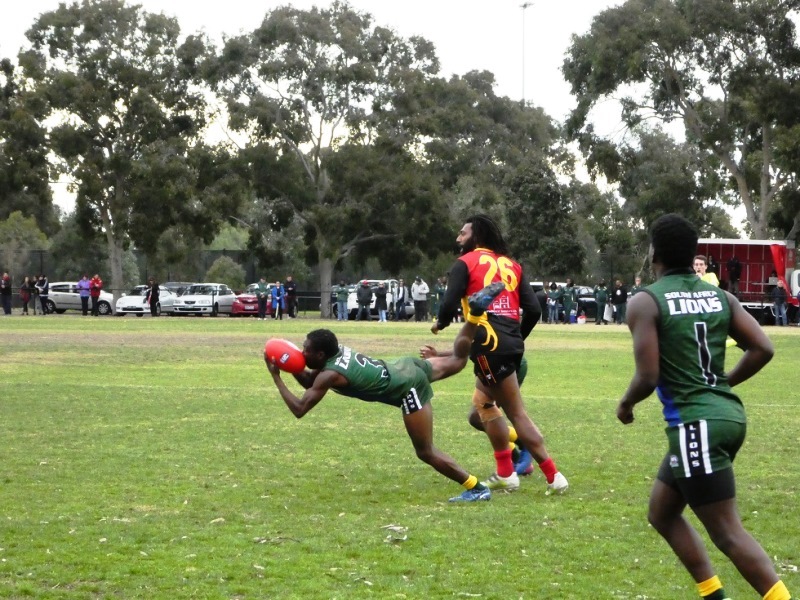 The third quarter commenced with the job ahead of them for the Lions. Though the team was demoralised by the results of the second quarter they had re-grouped after the main break. Malibongwe Mlamli #28 and Mandilakhe Lungile #22 were again working hard for the Lions around the ground. Mosquitos Paul Phillip #24 and John Ikupu #26 were working well together. John Ikupu #26 passed to Emmaus Wartovo #12 to goal from the arc. Malibongwe Mlamli #28 and Mandilakhe Lungile #22 were trying to hold back the tide. But Gideon Simon #16 passed to Brendan Beno #15 inside the arc for another goal to PNG. David Openi #20 goaled from the arc near the boundary line when the ball came out wide. The Lions had done well to restrict the Mosquitos to just two goals for the quarter. The last quarter could have been seen as an anti-climax but there was still a lot of good football to be witnessed with lots of good passagesl and some spectacular marks. Luzuko Mlonyeni #17 and Tshobboko Moagi #20 were working well together and with Asanda Funda #9 providing spirited resistance. John Ikupu #26 came back to star early in the last quarter. He passed to Hewago Paul Oea #1 for Kataha PauliasSiwee #23 to waltz into an open goal. Soon after he passed to Emmaus Wartovo #12 to goal from the arc. Hewago Paul Oea #1 with a burst of speed ran around the pack to snap truely but it was Scott Johnson’s #6 quarter. He was very visible in the packs and was rewarded with a snap on goal from a gather. Kelly Kaugla #4 also snapped from a sharp angle for a goal. A string of passes from the P.N.G. backline produced another goal from close in. Lion’s Karabo Marokoane #18 executed a superb legal bump on Laurie Logo #22. Scott Johnson #6 took a spectacular mark to finish the quarter and the game.. 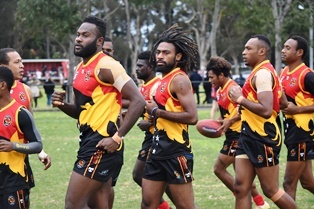 It was another superb display of football from PNG that became more dominant the further the game went on. They dominated the stoppages and spread the ball wide. Towards the end theys busted the packs wide open whilst the smaller players simply ran around the opposition. The difference in the score reflected the difference in ability but the Lions inability to score a goal was more a reflection on the Mosquitos defence rather than any lack of ability. As it turns out PNG did kick enough to boost their percentage and when Ireland lost to NZ on the last kick of the day after the siren, PNG players and supporters thought they had done enough to make it through to the final at the MCG against NZ. Once this was confirmed their joy and relief was visible. 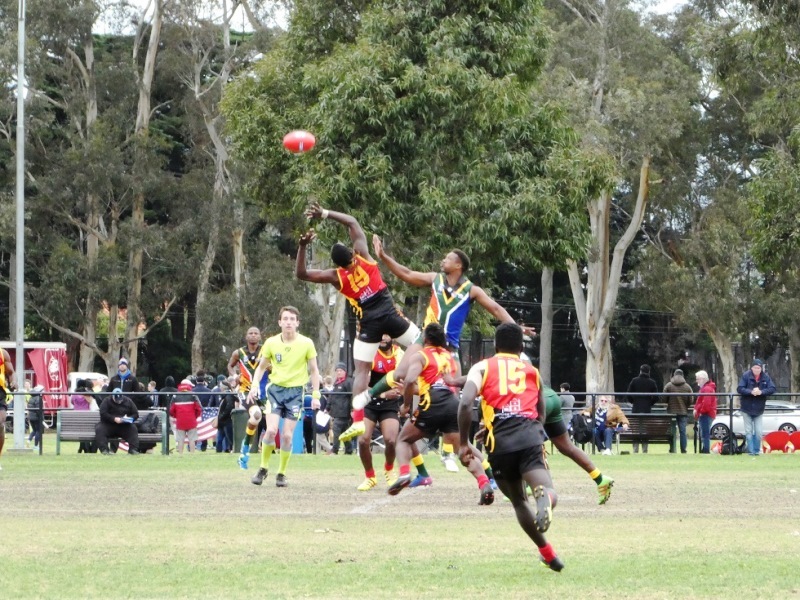 They continue their record of playing in every IC grand final in the 6 editions of the competition. The other five are history now though and NZ have never looked harder to beat.